When Declan opened his eyes again, he didn’t know how much time had passed. The house was deadly quiet. O’Hallon was nowhere to be seen. Sluggish, Declan crawled forward and sat up beside Keira. He could barely breathe, due to the effort to move and the loss of blood, but he pulled her lifeless body onto his lap and held her close. He hugged her tight against his chest. He buried his face in her hair, which was covered in blood, and cried like he hadn’t cried since he was a little boy. He felt like he was six again. active and vivid imagination. She was a talkative child who would disrupt the class by engaging her colleagues in endless conversations. She loved telling them the stories her grandfather used to tell her. Since then, she has become a hungry reader. 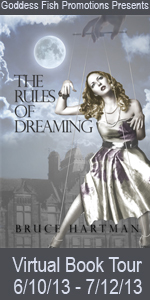 She will read anything and everything she could get her hands on – from the classics to erotica. 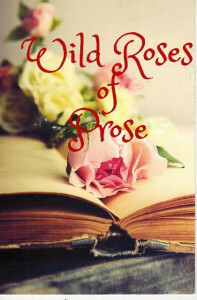 That’s how she has become a writer of erotica and romance, as well. 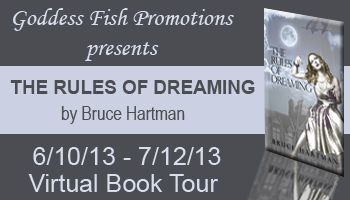 Bruce Hartman’s novel has far more than an intriguing title. 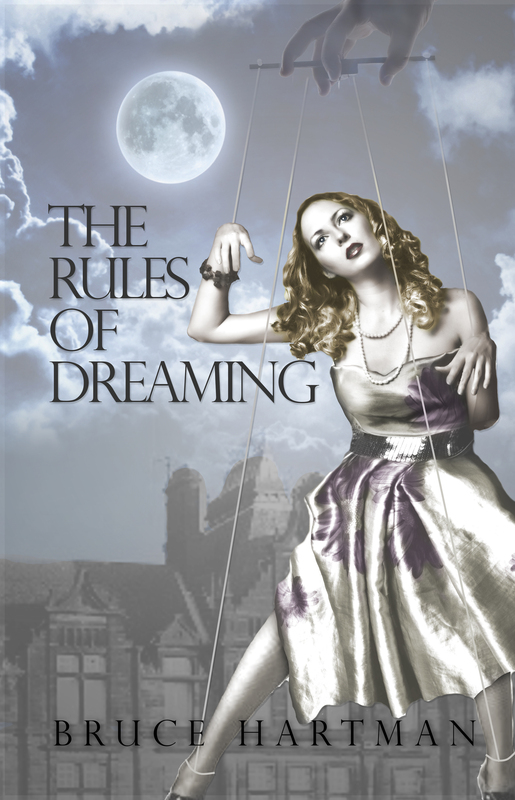 Take a look at this blurb and Nicole’s interview then see if you can resist grabbing The Rules of Dreaming for your Amazon shopping cart! Amazon is waiting to hear from you. A novel of madness, music — and murder. Fortunately, we were able to interview Nicole P. shortly after she was discharged from the Institute, and before she became too entangled in the lives of Dr. Hoffmann and the Morgan twins. Nicole is a 28-year-old Irish graduate student in literature at a university in New York City. After breaking up with an abusive boyfriend, she moved to Egdon, a small town northwest of New York which is home to the world-famous Palmer Institute. Why did you move to Egdon? After the breakup with Richard, I needed to get out of the city. I needed to put my life back together. Ironically, I thought moving up here would be good for my mental health. Why do you say ‘ironically’? Because I ended up in the loony bin. You were admitted to the Institute? (Nodding) I don’t even know why. Dr. Hoffmann says I was babbling incoherently. You see, I’ve been desperately worried about finding a topic for my dissertation. Just a couple of weeks. Most people—the Morgan twins, for example—have been in there for years. I was lucky to get out alive. And now you’re out. How does that make you feel? I guess you could say I have mixed feelings about going home, if you want to call my dingy little apartment home. The clutter is still here, just as I left it, even the dirty dishes in the sink. There’s comfort in that, I suppose. Getting back to normal, all the little routines of life—that’ll put my mind in the right groove, won’t it? What groove is the right groove? Washing the dishes, taking out the trash—what a smell!—cleaning the toilet, vacuuming the rug. All that will distract me from the bigger issues, won’t it? What bigger issues do you have in mind? When I got home I was famished and everything in the refrigerator was sprouting black spots and patches of hair. Was there anything in the cupboards? Half a box of stale biscuits, a can of chicken noodle soup. Barely enough to take me through what promised to be a long night. So you’re worried about getting enough to eat? My apartment is frighteningly isolated—at the top of a dark winding staircase used only by feral cats—and positively gothic in its gloom. It’s the kind of place where a woman could be murdered in her bed and none of the neighbors would notice or care. There was one bright spot: the computer was still on, waiting faithfully for my return. The screen was blank but all I had to do was touch the space bar and a magic technicolor world rose up before me. Out of habit I opened my “Things To Do” folder. Most of it’s out of date now—unminded reminders, dead deadlines, pointless appointments. With one sweep of the mouse I consigned the entire contents of the “Things To Do” folder to the trash bin. It’s a grand feeling, having nothing to do. Yes, it is. So that’s how you feel now—? Bread, milk, eggs, corn flakes. “Keep from going crazy”? You put that on your “Things To Do” list? It’s ridiculous isn’t it? How am I going to keep from going crazy if I have to think of a thesis topic? Do you have any ideas for your thesis? I just had a brilliant idea. I’m going to write about authors appearing as characters in other authors’ fictional works, where they meet characters from their own stories who were based on people they knew in real life, only now they’re characters in somebody’s else’s story, not their own, and—well, you can see how convoluted it gets. And why I had to put that one on top and keep it there. Why you had to put what one on top? “Keep from going crazy.” I had to put that one on top of the “Things To Do” list. Easier said than done, though. Especially when you might already be crazy. No, Dr. Hoffmann said I’m definitely not there yet. No reason to think I ever will be. So there’s still hope, even if I do have to come up with a thesis topic that will satisfy the Dead White Males who run the Critical Studies department. So what’s your plan? To keep from going crazy, I mean. Are you taking any medications? As much as I like Dr. Hoffmann, I want to accomplish that particular Thing To Do in my own way, without any help from the pharmaceutical industry. So as soon as I got home I took the pills he gave me out of my purse, and without thinking very much about it I ran into the bathroom and flushed them down the toilet. Late last summer, after less than two months at the Palmer Institute, I witnessed an extraordinary performance. One of my patients, Hunter Morgan (that was not his real name), sat down at the piano in the patient lounge and started playing like a virtuoso. Hunter was a twenty-one year old schizophrenic who had lived in the Institute for the past seven years, and as far as anyone could remember he’d never touched the piano before. The piece he played was classical music—that was about all I could tell—and it sounded fiendishly difficult, a whirlwind of chords and notes strung together in a jarring rhythm that seemed the perfect analog of a mind spinning out of control. He continued playing for about ten minutes and then suddenly stopped in the middle of an intense climactic passage. Without acknowledging his audience—which consisted of his sister Antonia, his nurse Mrs. Paterson, a few other patients and myself—he stood up from the piano and ran out of the room. Since I was new at the Institute, the impact of this performance was lost on me at first. I assumed that Hunter had been studying the piano from an early age. It wasn’t until later that afternoon, when I reviewed Hunter’s chart and questioned Mrs. Paterson specifically about the piano playing, that I realized how uncanny this incident really was. Bruce will award a $50 Amazon or BN.com gift card (winner’s choice) to one randomly drawn commenter during the Book Blast. I’m sure Nicole and/or Bruce would be happy to answer your questions.